What is Abraham Lincoln’s most noteworthy speech, proclamation, letter, etc.? The Emancipation Proclamation? His Thanksgiving Proclamation or proclamation for a National Fast Day? Perhaps it was his 1862 Annual Message to Congress, his 2nd Inaugural Address, or his last public address in 1865? Of course the “go to” answer is often what we now refer to as The Gettysburg Address. The choices are almost endless. 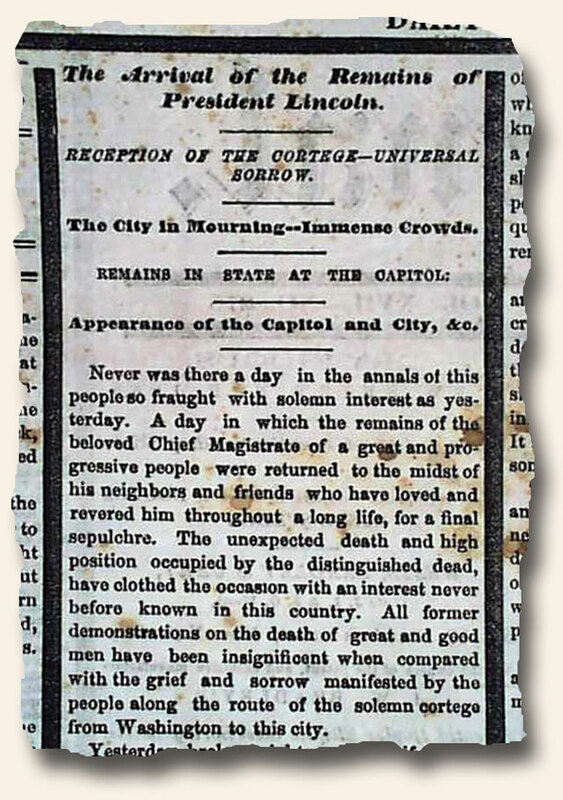 However, below is a candidate which appeared in an issue of The Crisis (Columbus, Ohio, May 4, 1864) I’d like to throw into the mix. Why it flies under the radar of notoriety and has never received more recognition is rather perplexing. What are your thoughts? Note: I’d like to thank a friend of Rare & Early Newspapers for suggesting I take a 2nd look. 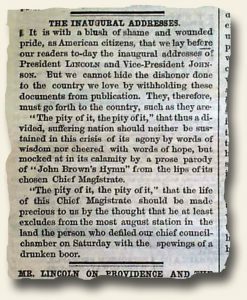 The “Boston Daily Courier” of May 19, 1864, contains a fascinating sidebar in American history, the printing of a “fake” Lincoln Proclamation which appeared in two New York newspapers but was ultimately determined to be bogus. 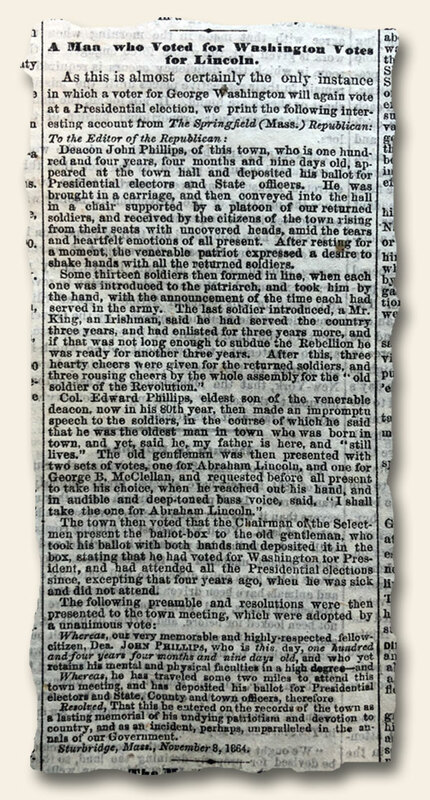 The “proclamation” is prefaced with a cautioning statement: “The document which made its appearance yesterday, purporting to be a proclamation of President Lincoln, is copied for the information of our readers:”, then the full text (see below). 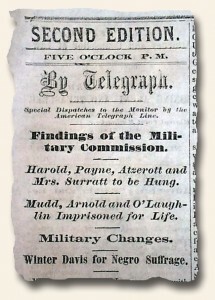 This was a scheme by Joseph Howard, a newspaper journalist and a bit of a prankster throughout his career. Howard and an acquaintance had hoped to make a profit on declining gold prices if news from the front was bad. They acquired the stationery and other items necessary to make it look as if a story had come in on the wires to the headquarters of the Associated Press of New York, the clearing house for official wire stories coming from Washington. They forged the Proclamation from the president, which called for the drafting of an additional 400,000 soldiers, obvious evidence the war wasn’t going well. It was delivered to the offices of various New Your newspapers. Only two actually published the story but it caused such that Howard was arrested two days after the story appeared and placed in Prison. 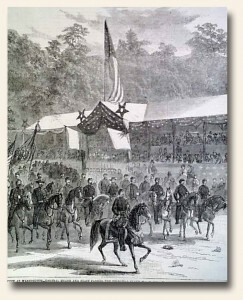 He was released on Lincoln’s personal order on August 24, 1864. Many are quite familiar with President Abraham Lincoln’s Thanksgiving Proclamation of October, 1863. However, few have read or heard of his similar proclamation from a few month’s prior which helped build the foundation for his famous October proclamation. 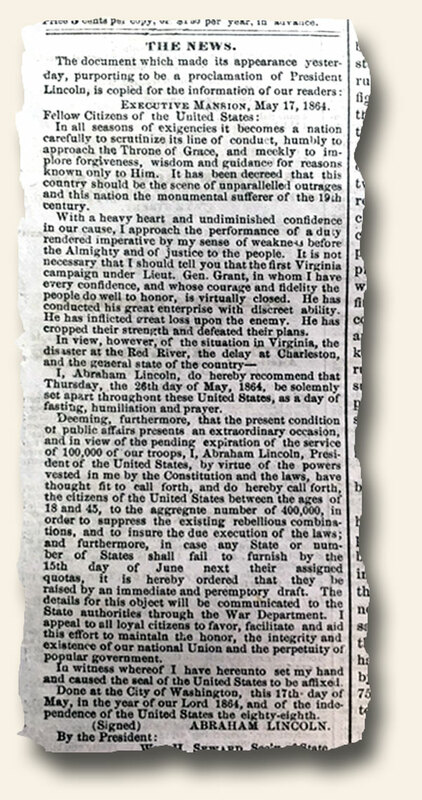 The Star of the West, July 25, 1863 contains the text (see images below) of this earlier declaration calling for a day of thanksgiving and prayer – words which are apropos as we prepare (in the U.S.) to celebrate Thanksgiving. Note: We’ve included the text of this famous proclamation below. The year that is drawing towards its close, has been filled with the blessings of fruitful fields and healthful skies. To these bounties, which are so constantly enjoyed that we are prone to forget the source from which they come, others have been added, which are of so extraordinary a nature, that they cannot fail to penetrate and soften even the heart which is habitually insensible to the ever watchful providence of Almighty God. In the midst of a civil war of unequaled magnitude and severity, which has sometimes seemed to foreign States to invite and to provoke their aggression, peace has been preserved with all nations, order has been maintained, the laws have been respected and obeyed, and harmony has prevailed everywhere except in the theatre of military conflict; while that theatre has been greatly contracted by the advancing armies and navies of the Union. Needful diversions of wealth and of strength from the fields of peaceful industry to the national defense, have not arrested the plough, the shuttle or the ship; the axe has enlarged the borders of our settlements, and the mines, as well of iron and coal as of the precious metals, have yielded even more abundantly than heretofore. Population has steadily increased, notwithstanding the waste that has been made in the camp, the siege and the battle-field; and the country, rejoicing in the consciousness of augmented strength and vigor, is permitted to expect continuance of years with large increase of freedom. No human counsel hath devised nor hath any mortal hand worked out these great things. They are the gracious gifts of the Most High God, who, while dealing with us in anger for our sins, hath nevertheless remembered mercy. It has seemed to me fit and proper that they should be solemnly, reverently and gratefully acknowledged as with one heart and one voice by the whole American People. I do therefore invite my fellow citizens in every part of the United States, and also those who are at sea and those who are sojourning in foreign lands, to set apart and observe the last Thursday of November next, as a day of Thanksgiving and Praise to our beneficent Father who dwelleth in the Heavens. And I recommend to them that while offering up the ascriptions justly due to Him for such singular deliverances and blessings, they do also, with humble penitence for our national perverseness and disobedience, commend to His tender care all those who have become widows, orphans, mourners or sufferers in the lamentable civil strife in which we are unavoidably engaged, and fervently implore the interposition of the Almighty Hand to heal the wounds of the nation and to restore it as soon as may be consistent with the Divine purposes to the full enjoyment of peace, harmony, tranquility and Union. 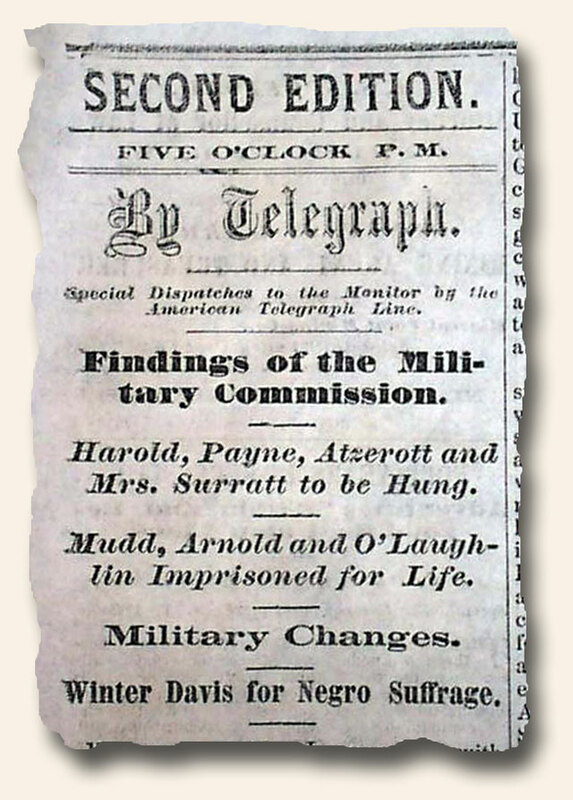 What news was reported in July, 1865 – 150 years ago? The horrors of the Civil War were now in the past, but the emotions and sorrow of the assassination of President Abraham Lincoln were still fresh. Where would the nation go from here? How would we move forward? Was unity possible? 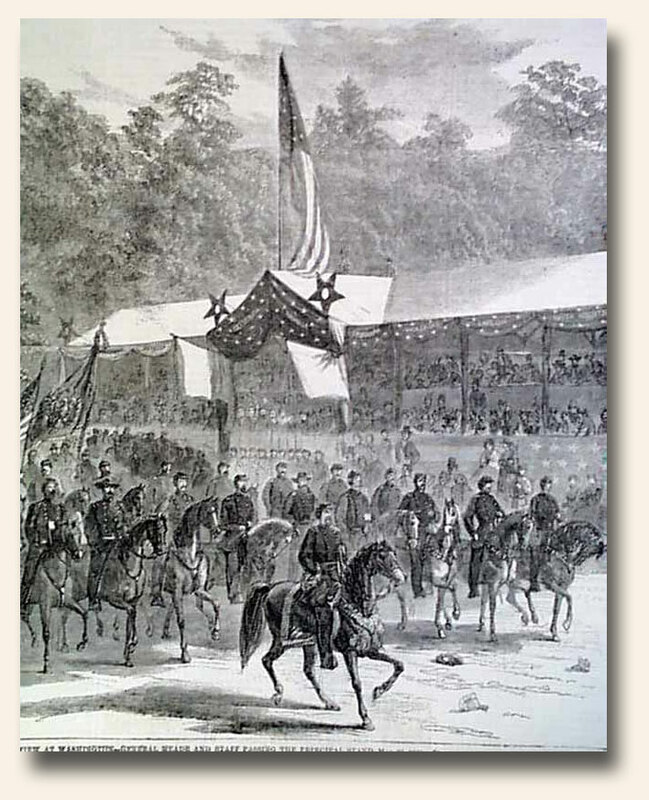 A sampling of what you will find may include articles and info regarding: The end of the Massachusetts 54th Regiment, the hanging of the Lincoln assassination “conspirators”, the capture of Kirby Smith, P.T. Barnum’s tragic fire, the emancipation of slaves, the return to a degree of normalcy as shown through interest in post-war sports (baseball and others), and more. 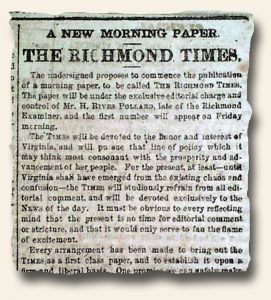 Please enjoy your travel into the past as you browse through the currently available original newspapers! 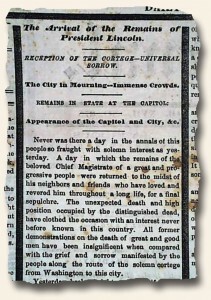 A sampling of what you will find may include articles and info regarding: President Abraham Lincoln’s funeral, the capture of Jefferson Davis (found wearing a woman’s dress), the first Hebrew free school in New York City, the trial of the conspirators (including Mrs. Surratt), follow-up detailed Civil War battle reports from several Generals, a well-known print in a Harper’s Weekly titled, “When Johnny Comes Marching Home,” and more. Enjoy!